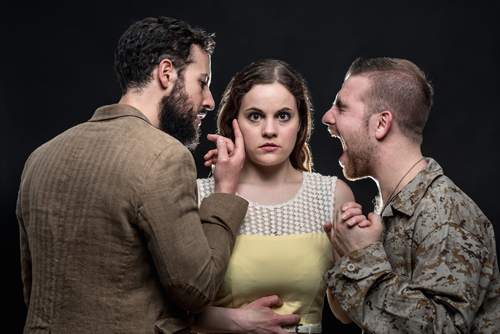 When approaching the ticket desk for Office Hours, playing at this year’s Toronto Fringe Festival, the welcoming volunteer cautions you with a trigger warning — frank and candid discussions of PTSD ahead. The kind of PTSD that often haunts those who have witnessed war first hand. I was expecting a show like this to be explosive. What I found was that it came just short. And, well, perhaps that’s a good thing. Office Hours, in this case, refers to the hours when a university professor — Chad (Michael Orlando) teaching LITT 354: War and Violence in Modern Literature and Film — is available outside of class to discuss the syllabus, papers, and other pertinent needs his students may have. Bright, young Caroline (Nicole Marie McCafferty) takes more away from this course than most. Her boyfriend Tyler (Greg Solomon) has recently returned from his tour of Iraq, on leave after an IED took out half his squad. The strength behind Office Hours comes from the heart of the performers and their dedication to the material at hand. Each character is solidly portrayed and you can’t help but feel for all of them. In Solomon’s eyes, I see the frenetic chaos of a man trying his hardest to hold his mind together. So haunted is he that you see it in the unsteady quiver in his hands . When he’s explaining to Caroline the reason why he’d rather be back in a war zone than at home, that out there he had a mission and people willing to die for him, his words echo loudly for me. In my past, I’ve befriended a few people who served in the US Army and I’ve heard them say the same. Orlando also does great work to round out the trio. As the professor, his job is to be the mediator as best he can, and to help maintain a sense of calm. Caroline is his student, and he has an obligation to protect her, even if it means in turn reaching out and helping Tyler. Orlando exudes a nurturing confidence in his performance. There were a few technical quibbles I noticed — as the venue for Office Hours is the Trinity St Paul church, the room is cavernous and the echoing somewhat distorted some of the dialogue, making it harder to understand. The stage is also lit by portable LED lights, and it appeared that the lighting was being sorted out in the middle of an intense scene — the colouring of the lights changed slightly in the middle of dialogue. Overall, though, Office Hours is a well thought out and constructed piece of theatre that I’m glad I got the chance to experience. It’s certainly worth the watch. Content Warnings: Gunshots, Mature Language.